Talk about herding cats! 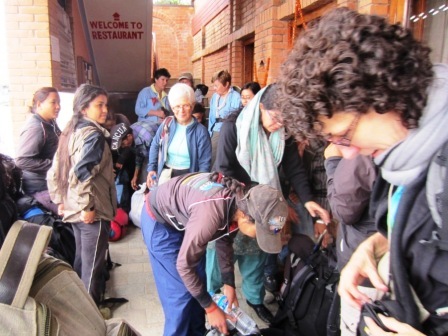 20 women (9 trekkers, two guides, 9 assistants/porters) trying to get organized at once on the front porch of the Chhetri Sisters guesthouse. The people all fit inside three large SUV’s; half the gear went on top held on by bungee cords and tarps. Trekkers carry their own day packs with a few layers of clothes, at least two quarts of water, rain gear, and whatever else you deem essential for the day. Beyond that, 3 Sisters porter’s packs are limited to 25 lbs – 20 lbs for the guest and 5 lbs for the porter. 3 Sisters porters are provided with hiking shoes and decently balanced back-packs, and wear logo shirts and jackets while on the job. 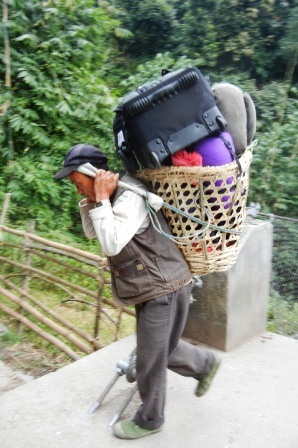 To help you appreciate how ground-breaking this is for Nepali touring, here is a shot of a typical male porter on the trail. The whole load is balanced with a tum line across the forehead; if it should slip, he 1) tumbles or 2) strangles and either way is 3) dead. The trail to Hille, our first night’s stop, goes up through rain forest past villages where rice was being harvested and left to dry in the sun, past blooming hibiscus, poinsettias, and twining squash vines. Fog and overcast made walking easier, as we climbed up and up on dirt, granite, marble steps, as the Mohdi Kohla River receded further and further below. At one point we were overtaken by several impossibly tall and fit Germans wearing helmets and carrying kayaks. Suddenly they plunged off the trail and down a narrow footpath – they were evidently kayaking through the rapids back down the valley to Pokhara. This takes adventure trekking to an entirely new level! 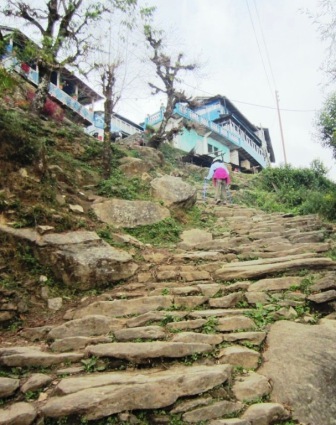 Hille is a small town whose livelihood depends on trekking traffic and rice. In this part of Nepal the lucky color is blue (probably still influenced by Hindu tradition, where blue is the color of Vishnu.) So every guest house is painted the same electric blue – very appealing visually but hard to distinguish one from the other. Warning: If your guest house advertises solar showers, this means that if the day has been foggy, or if you arrive behind other groups of trekkers, there will be no hot water for you. Set modest expectations! It was here that we first experienced the unpredictability and scariness of altitude sickness. All three of us live at or near sea level but had trained for the trek by hiking at 9000 feet in the Rockies; DB had spent quite a bit of additional time with additional hiking at 9000-9500 feet in the Sierras. At Hille the elevation is a modest 4800 feet. DM and I were tired but basically exhilirated by our first day’strekking experience; DB was stupefied. The combination of altitude and exertion left her so exhausted that she was between incoherent and comatose. DB and I managed to get some aspirin into her, manoevered her into her sleeping bag, and crossed our fingers. Wow! I’ve always wanted to visit Nepal. I’ve also trekked the Annapurna ranges, one of the best trips that I have ever done. I have not yet blogged about it, but I certainly intend to. Now, maybe I am missing something, but I see a post day 1, and I see a post day 8, do you have any posts of the treks, my memory is that the pictures of the mountains of Nepal are the best! 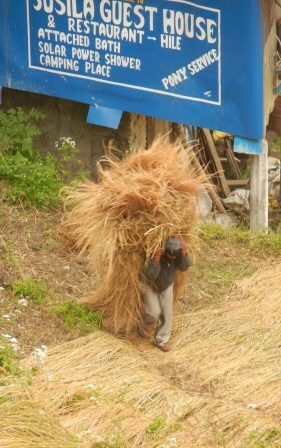 I was in Nepal for a week before beginning the trek – so I may have mixed up day 8 (in Nepal) and Day 1 (of the trek). I’ll try to clarify this. That’s ok, I think I guessed as much and it’s not a problem, I’m just waiting for the really awesome photos to come!